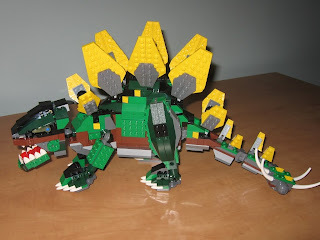 For Christmas I received the Lego Stegosaurus. I had been wanting this set for a while and was eagerly anticipating it. Of course, with a toddler running around the house it was several days before I had time to build it, but it was well worth the wait. This set is one of the best Lego kits I have seen in a while. It has 731 pieces and comes with instructions for three different models (as many Creator kits now do). 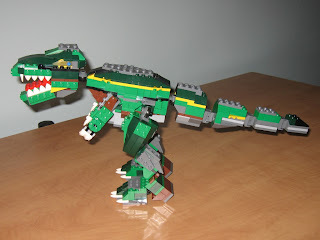 The main model, the Stegosaurus, is easily the best of the three, but the Tyranosaur and flying dinosaur (I'm not sure it's anatomically correct for any flying dino) are still decent builds. The instructions are easy to follow; any child should have no difficulty at all even though the building techniques are somewhat advanced. In fact I found the instructions a little too simplistic and found that I had to flip a lot of pages to get only a few pieces put on. But I have become adept at noticing when there is going to be a lot of repetition for building a symmetrical model (such as the legs: they are mirror images of each other) so I can save time by building both hind legs at the same time, etc (That saves a TON of time when building the AT-AT). One thing I noticed about this set was that the piece selection is truly stellar. Many Lego kits come with part selections that are not what you'd expect to see in a given model. For example, the AT-AT is a big grey walking machine, but it is actually full of bright blue and red bricks for the internal structure. When building the main model that is not a big deal because those pieces are hidden, but if you want to take it apart and build something else those pieces lose a lot of their value. The reason Lego puts these primary-coloured pieces in is to make it easier for children to build the set because the pieces are easier to find, harder to mistake one for another, and easier to follow in the instructions. Thankfully, the Stegosaurus model has almost no unnecessary colours in it. It features a fairly wide palette of colours, mainly green, dark green, dark grey, brown, and yellow, but between the greys and greens and the odd black or brown piece here and there the instructions get buy without any bright blue or turquoise ruining the part selection. The importance of this can't be overstated. It means that every single piece is useful for further construction of dinosaurs. And these earth-tone colours are also extremely useful for landscaping. And the dark green would look really good on a car or space ship. The greys, of course, are super versatile. Suffice to say that you don't regret any of the pieces in this kit. The resulting dinosaurs are not a single uniform colour, but they still look good. The construction of the models is also quite well done. The stegosaurus is most impressive; it has a good feel, decent posability, and an imposing appearance. My only complaint is that I find the mouth too fragile; if I open the lower jaw it often comes right off. The tyrannosaur is quite good and doesn't seem to suffer for being the secondary model. You don't get a feeling that they compromised the design to make it fit the parts selection of the Stegosaurus. My main complaints about this model are that I don't like how the hands look and how the head is attached to the body. The head joint is the worst part: the head only turns left or right which severely limits how the dinosaur can be posed. I was pleased to see a few surprising uses of pieces, such as using wing pieces instead of plates for the tyrannosaur. The yellow line along its back is actually the yellow wing pieces from the stegosaurus's plates; they are merely turned inwards so that the wing portion is hidden. This leaves gaps where the wing piece doesn't fully cover the studs it is placed on, but as this is inside the body of the T-rex it is invisible and it doesn't hurt the model in any way. This use of these pieces in this way is what Lego is all about: building stuff with the pieces you have. Overall I strongly recommend this kit. Great part selection and good models. Easy and fun to build. What's not to like?